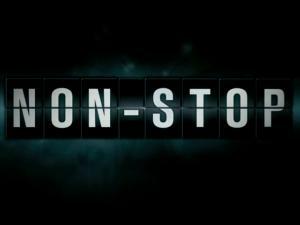 Non-Stop is misleading, just like its characters. Upon looking at the poster and blurb, my first assumption was that it was an action movie in the vein of the Taken movies. 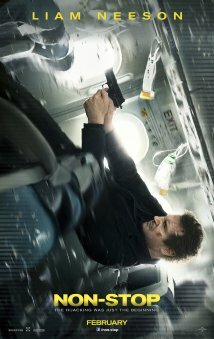 I saw a version of the poster where a blurb mentioned something about everything being taken from him (just to make sure everyone would watch it on the basis of it being exactly the same as Taken, I bet), but it’s not a non-stop action movie. It’s a smart, suspenseful thriller. I was kept guessing throughout the entire film, which is something a lot of modern thrillers can’t claim. Let’s start with the plot. The movie begins with Liam Neeson mixing a mug of bourbon and draining it entirely after an angry phone call to his supervisor. He whizzes past airport security, and in this scenes, you can see the majority of the main cast in the background. You can even hear Julianne Moore talking about getting a window seat. It was a shaky beginning, literally. The camera shook while Liam Neeson walked, and considering the way it uses extreme close ups and how it leaves most of the background out of focus, I was starting to think this was going to be another Jack Ryan: Shadow Recruit. However, my fears were completely uncalled for. It began to redeem itself during the takeoff of the plane. The camera, of course, shook. But, it shook in a controlled way so you could still keep track of everything. 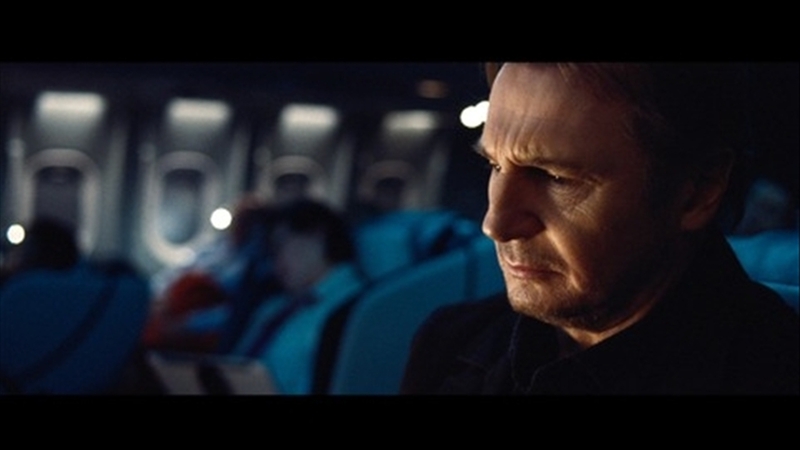 The sound was realistically loud, but you could still hear Liam Neeson talking about his daughter giving him a ribbon for good luck while Julianne Moore sits beside him and attempts to calm this huge action star that gets nervous during takeoffs. With the lights turned off so that everyone can sleep, Liam Neeson suddenly gets a text. I realize I keep referring to the actor, but that’s because the actor completely encompasses the movie. He’s playing essentially the same character he’s always played, but it’s all right. Because it’s always interesting. Anyways, the text is from an unknown number, and after the usual round of questioning, the mysterious figure reveals that he’s going to kill someone every twenty minutes unless 150 million dollars gets wired into his account. Interesting premise. 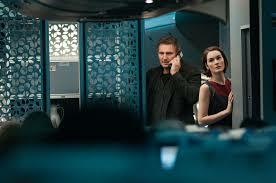 Liam Neeson notifies the pilots, and they report it to their superiors. I’m afraid I can’t go into anymore detail about the movie from this point because I’d risk giving you enough time to figure out the killer(s). This is as suspenseful as they come. It’s similar to Air Force One in the sense that it’s on a plane, but that’s where the similarities end really. Liam Neeson looking very somber. Michelle Dockery (Downton Abbey) plays a stewardess that’s had relations with the co-pilot, and she’s on the very short list of people Liam Neeson can trust. Another point goes to the film for the fact that it acknowledges racial profiling. A Middle Eastern passenger is on the plane, and in his first appearance, everyone looks at him suspiciously. One of the other passengers, Corey Stoll (House of Cards) even makes a remark about it later in the film. Is it groundbreaking? No, but it doesn’t avoid it, either. It’s true. It’s been awhile since 9/11, and it seems like movies and shows have been given the green light to talk about it (The Golden Boy, Blue Bloods, Homeland are but a few examples of this), but it’s still a sore subject. So, the fact that the film acknowledges that the system isn’t perfect is really refreshing. I’ve praised this film. Now it’s time for the flaws. Here’s a slight warning. The following isn’t really a spoiler, but it can be construed as spoiler-ish, so it’s just a heads up. I don’t pick on plot points or anything, so feel free to skip this section. The fight scenes are really well done, but like most action movies, it suffers from the Invincibility Syndrome. Die Hard 5 is the pinnacle of this example. John and his son kill hundreds of enemies, but oh no, their clothes are a bit blackened from all the explosions and they have a few cuts! Poor guys. Let’s drag ‘em to the emergency room! The Taken movies are also fine examples of this. Oh, yeah, I’ve absolutely decimated the entire population of Bulgaria, but I’m fine. See you in the next movie! In this movie, Liam Neeson gets into some pretty unbelievable fights that end with him having a tiny little bruise at the corner of his forehead. Meanwhile, his enemies are… well, let’s just say they didn’t get off with a bruise. So, that doesn’t really damage the film as a whole, but I would’ve enjoyed it much more if he was, I don’t know, limping or bleeding a lot more at the end? I understand that action movies can’t end with the main character in a coma, but I’m sure I’m not the only one that wishes they looked like they went through the ringer a bit more. The final verdict is that this is a great movie. I had maybe twenty possible suspects, and I still didn’t expect the ending. That makes it a really well planned film, if you ask me. Are there flaws? Yup. Liam Neeson makes some decisions that really don’t make me think he’s the sharpest tool in the shed, but it’s very entertaining. For me, it’s definitely better than the Taken movies. He doesn’t have as good of a hook as in Taken (“I don’t know who you are…), but my interest was definitely held for a lot longer here. If you need any more reasons to watch it… it’s a Liam Neeson movie. There you have it.